Introduction: Repair by arthroscopic double-row suture bridge technique is widely accepted modality of treatment for repairable large-to-massive rotator cuff tears. Repair by mini-open approach has also shown comparable results in such cases. Double-row repair either by mini-open or by arthroscopic approach imposes substantial financial burden on patients belonging to economically deprived & uninsured group. Surgical Technique: We propose a new suture configuration for cuff repair by mini-open approach in which variant of modified Mason-Allen suture technique is used in transosseous manner to provide suture configuration similar to that of suture bridge double-row repair. 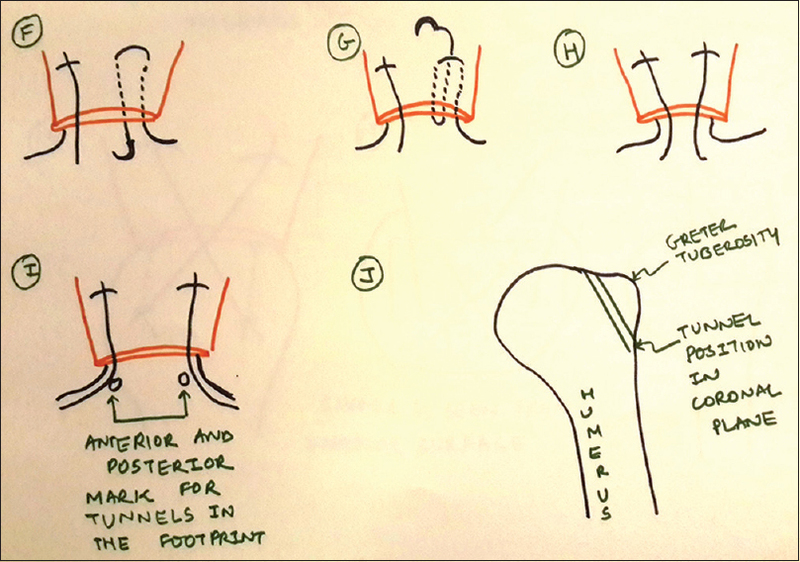 The knotless nature of the configuration reduces incidence of re-tear that is seen at medial row of the double-row suture bridge repair and the “X” configuration provides large area of contact between the cuff and the footprint which is the advantage of traditional double-row suture bridge repair. Apart from above advantages, this technique is very economical. الخلفية: الإصلاح بالمنظار مع خياطة مزدوجة الصف تعد وسيلة علاجية مقبولة على نطاق واسع لتمزق الكفة المدورة الكبير والضخم. وقد أظهر إصلاح النهج المصغر المفتوح نتائج مماثلة في مثل هذه الحالات. اما إصلاح الصف مزدوج إما عن طريق فتح صغيرة أو بالمنظار يفرض عبئا ماليا كبيرا على المرضى الذين ينتمون إلى مجموعة المحرومة اقتصاديا وغير المؤمن عليه. الطريقة الجراحية: نقترح تكوين خياطة جديدة لإصلاح الكفة من خلال نهج مصغر مفتوح التي يتم استخدام البديل من تعديل وسيلة خياطة ميسون-ألين عبر العظام لتوفير تكوين خياطة مشابهة لتلك التي خياطة تستعمل في جسر مزدوج الصف. ان استعمال الخياطة بلا عقدة يقلل من حالات تكرار التمزق والدى يلاحظ عند استعمال خياطة الصف الوسطي او المزدوج وبالإضافة الى ذلك فان الإصلاح في شكل جسر "X" التكوين يوفر مساحة واسعة من الاتصال بين الكفة وبصمة والتي هي ميزة مزدوجة لإصلاح جسر خياطة. وبصرف النظر عن المزايا المذكورة أعلاه، وهذه التقنية اقتصادية للغاية. A patient is positioned in beach chair position after general anesthesia with supplementary. Interscalene block is administered. Standard deltoid-splitting approach is used for exposure of subacromial space. Subacromial bursa is excised. Standard acromioplasty is done in indicated cases. Long head of biceps tenotomy or tenodesis is done when indicated. Supraspinatus and infraspinatus tear is identified. Traction suture is used to mobilize cuff to the area of footprint. 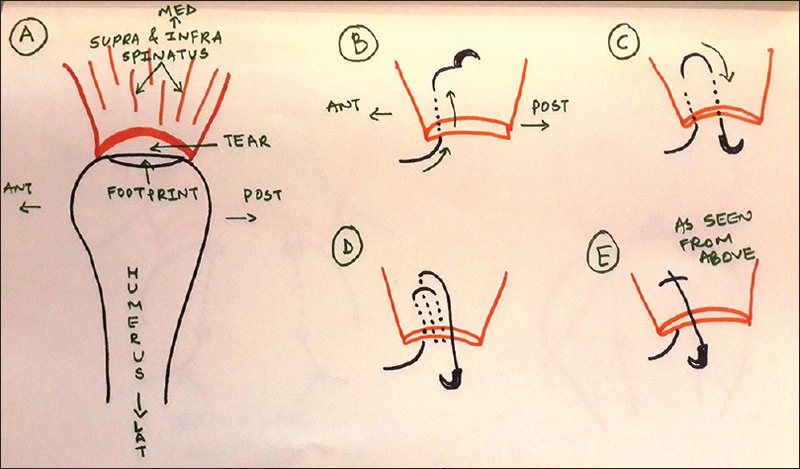 When required, mobilization of cuff tendon is done in cases with retracted cuff tears. Footprint of cuff is prepared with burr till healthy bleeding is appreciable. Nonabsorbable suture material of surgeon's choice is loaded on needle. Suture passed from anterior-most part of the tear medially in horizontal mattress fashion from articular surface to bursal surface anteriorly and from bursal surface to articular surface posteriorly. Same thread is now passed in simple suture fashion taking bite from articular surface medial to horizontal mattress thread and exiting to bursal surface. This completes modified Mason-Allen configuration [Figure 1]. Steps II and III are repeated for posterior part of the cuff. Finally, we have total four free ends of the threads, i.e., two threads belonging to horizontal mattress part of the stitches which are at articular side of cuff and two belonging to simple suture part of the stitches which are at bursal side of the cuff. Now, two entry points for tunnels are marked at anterior and posterior part of the footprint area. These tunnels are equivalent to medial row of the double-row suture bridge technique. Tunnels are prepared either with the help of a tunneler or threads can be passed simply by appropriately shaped bone-cutting needle. Now, the two articular side threads which are part of horizontal mattress sutures are passed through these two tunnels exiting not <1 cm laterally. These two exit points laterally are going to act like lateral row of double-row suture bridge configuration [Figure 2]. Bursal surface thread of anterior suture is tied with articular surface thread of posterior suture which was passed through the posterior tunnel. 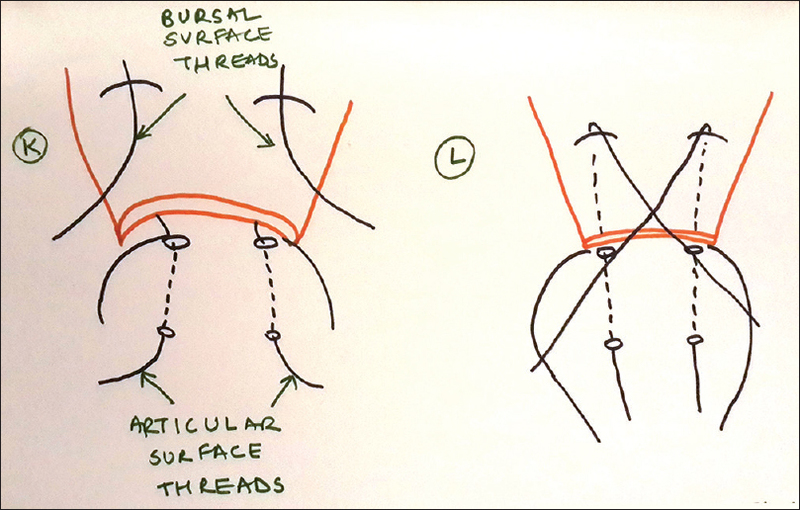 Similarly, bursal surface thread of posterior suture is tied with articular surface thread of anterior suture which was passed through anterior tunnel [Figure 3]. While tying the knot, other corresponding end of the thread is required to be kept in tension by an assistant to prevent loosening of the repair. This produces “X” configuration of threads crossing each other over the cuff tissue. To have crossing of the threads well medial to tear edges, it is important to have exit of the tunnels not too lateral from the entry point of tunnel. Wound is closed in layers. This concludes knotless transosseous suture bridge equivalent suture configuration. Such repair provides good compression with wide area of contact between cuff and footprint. Knotless nature of repair reduces re-tear chances at medial row. The strength of the repair is robust because of the inherent strength of modified Mason-Allen suture technique. Moreover, finally, such repair technique is very economical [Figure 4]a and [Figure 4]b. The reattachment of the ruptured and often retracted rotator cuff tendons to its footprint is the most important step in rotator cuff repair surgery. The outcome of cuff repair surgery depends on many variables such as contact area and pressure between the cuff and its footprint, tendon-bone interface motion, repair strength, tissue quality, and biochemical factors. Cuff can be repaired either by arthroscopic surgery or by open surgery. There are different implants as well as different techniques described in literature for cuff repair. Suture anchors and sutureless fixation devices are preferred implants of choice for arthroscopic repair whereas transosseous technique is widely accepted method of repair by open approach. Although sutureless fixation devices, traditional 5-mm self-tapping compressing corkscrew anchors, or biodegradable suture anchors  more or less provide robust fixation in the bone,,, there are some disadvantages such as suture anchor pullout and breakage of sutureless anchors 5 apart from increased financial burden to patients. Various suture techniques for cuff tear are described in the literature. Single and mattress stitches are so far the most commonly used suture techniques for cuff repair with suture anchor. Double-row suture bridge technique of repair is widely accepted type of arthroscopic repair which has advantages such as wide contact area between footprint and cuff and strong contact pressure but also has disadvantages such as increased type 2 re-tear rates  and substantial financial burden to the patient. In 1994, Gerber et al. described a modified Mason-Allen technique for transosseous rotator cuff tendon repair and showed that this technique is biomechanically stronger than the traditional single and mattress sutures. Modified Mason-Allen technique does not cause strangulation or aseptic tendon necrosis of the cuff. Our suture configuration is unique because it has advantages of suture bridge double-row repair without its disadvantages. Our technique, because of “X” configuration, provides a wide contact area and strong contact pressure between footprint and cuff tissue similar to suture bridge technique. Due to knotless nature of modified Mason-Allen stitch, chances of cuff strangulation or aseptic tendon necrosis at medial row are less in comparison to knotted medial row repair of suture bridge technique. Our technique, unlike suture bridge technique, is very economical to the patients because there is no need for the use of multiple implants. Other advantage of the technique is lack of steep learning curve that is involved in arthroscopic suture bridge technique. Our knotless transosseous suture bridge equivalent suture configuration for mini-open large-to-massive rotator cuff tear repair provides advantages of arthroscopic suture bridge double-row repair without its disadvantages. This technique is easy to practice and is very economical option which can provide robust fixation similar to that achieved by suture bridge double-row repair configuration. Park MC, Cadet ER, Levine WN, Bigliani LU, Ahmad CS. Tendon-to-bone pressure distributions at a repaired rotator cuff footprint using transosseous suture and suture anchor fixation techniques. Am J Sports Med 2005;33:1154-9. Ahmad CS, Stewart AM, Izquierdo R, Bigliani LU. Tendon-bone interface motion in transosseous suture and suture anchor rotator cuff repair techniques. Am J Sports Med 2005;33:1667-71. Kim DH, Elattrache NS, Tibone JE, Jun BJ, DeLaMora SN, Kvitne RS, et al. Biomechanical comparison of a single-row versus double-row suture anchor technique for rotator cuff repair. Am J Sports Med 2006;34:407-14. Cummins C, Marshall J, Murrell G. Rotator Cuff Repair with Sutureless Bioabsorbable Soft Tissue Fixation Screws, a Note of Caution. Presented at the 27th Annual Meeting of AOSSM, Keystone, Co.; 2001. Burkhart SS. Arthroscopic treatment of massive rotator cuff tears. Clin Orthop Relat Res 2001;390:107-18. Gartsman GM, Khan M, Hammerman SM. Arthroscopic repair of full-thickness tears of the rotator cuff. 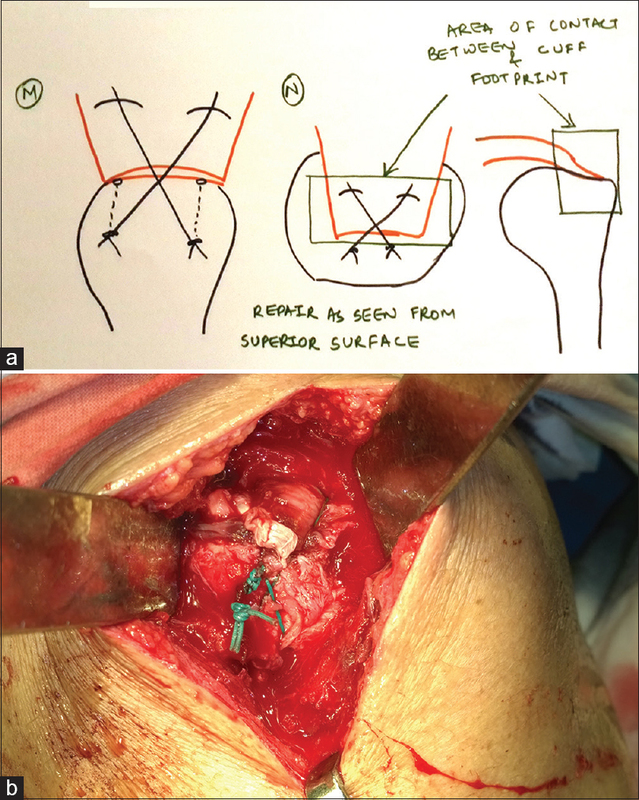 J Bone Joint Surg Am 1998;80:832-40. Tauro JC. Arthroscopic rotator cuff repair: Analysis of technique and results at 2- and 3-year follow-up. Arthroscopy 1998;14:45-51. Barber FA, Herbert MA, Click JN. Internal fixation strength of suture anchors – Update 1997. Arthroscopy 1997;13:355-62. Gerber C, Schneeberger AG, Beck M, Schlegel U. Mechanical strength of repairs of the rotator cuff. J Bone Joint Surg Br 1994;76:371-80. Cho NS, Yi JW, Lee BG, Rhee YG. Retear patterns after arthroscopic rotator cuff repair: Single-row versus suture bridge technique. Am J Sports Med 2010;38:664-71.